Plenty of folks wear green on St. Patricks' Day-- that is, unless you hone some deep-rooted hatred for the color. That is the case for the ​Washington Redskins' fan base, as in the NFC East, green is closely associated with the ​Philadelphia Eagles. 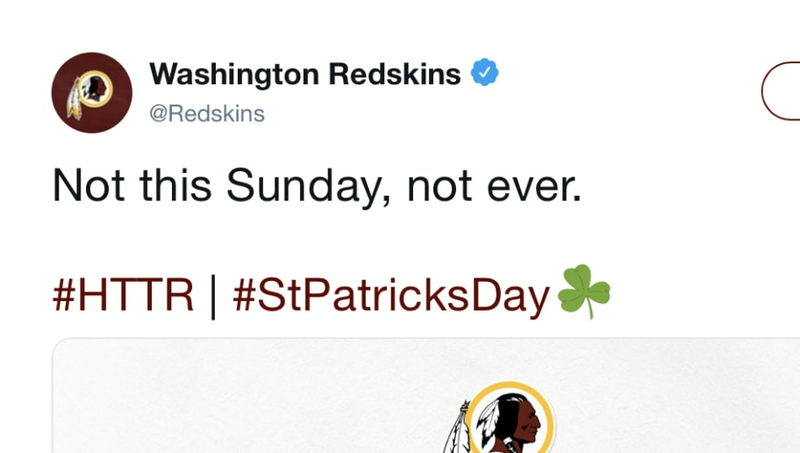 Redskins Twitter took action today, posting a message explaining that they understand why fans would not want to wear green, and told them that if someone pinches them for wearing the Redskins' colors instead, they have permission to pinch back. ​​The Redskins also called upon ​Giants and ​Cowboys fans to boycott the holiday's color as wearing green doesn't seem to be in their best interest, either. Washington seems ready to take some shots at Philadelphia as the 2019 offseason is officially underway. They may not be so eager to throw shade at the Eagles when the season kicks off, however, as the Redskins seem a ways away from contending for the postseason. The Redskins saw their season collapse when quarterback Alex Smith suffered a gruesome leg injury and missed the remainder of the season. After Smith went down, the Redskins finished the season 7-9 despite getting off to a 6-2 start. At least they're keeping up the holiday spirit in the best way possible.